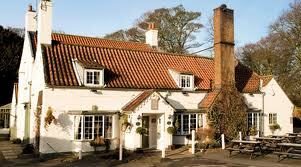 So thrilled the Michelin Guide has awarded the title of ‘Pub of the Year’ to East Yorkshire’s very own first gastropub to win a Michelin star, The Pipe and Glass, at South Dalton, north of Beverley. Having eaten there recently (review forthcoming), I know just how atmospheric the ancient building is and how friendly the staff are. As for the Food …… well, just amazing. Chef James Mackenzie and all his team are well-deserved winners. I also have a strong personal interest in that my son, designer Anthony Hodgson, has just returned from China after overseeing the printing of James’ first cookbook, ‘On The Menu’, which will be out shortly. Having been lucky enough to have seen bits of it in the making, it will be stunning. Look out for an early review. Meanwhile, sincere congratulations to James, Kate and everyone involved at The Pipe and Glass. East Yorkshire is so proud of you.